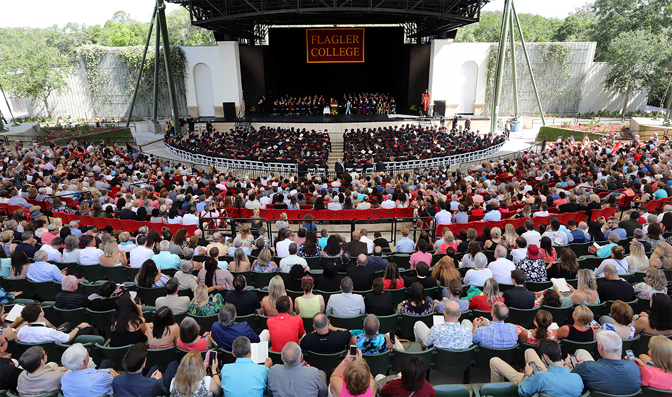 SAINT AUGUSTINE — Flagler College handed out diplomas to 402 seniors Saturday, April 28 at the St. Augustine Amphitheatre, including 27 locals from St. Augustine and Ponte Vedra Beach. There were also three Master of Arts in Education, Deaf and Hard of Hearing graduates: Bethany Anita Marie Hayden, Michele Lenita McCormack and Alyssa Renee Perez. Department awards were granted to thirty-eight graduates who rank among the top 10 percent of their class. Yasmeen Anis and Rachel Singer both received the President’s Award for Leadership, and Paige N. Armstrong and Alejandro L. Quiñones both received the President’s Award for Service. Professors Dr. Thomas “Doc” DeLaughter and Don Martin were both recognized for their service to the college, as both retired this year from the faculty. For his 40 years of service to the college, Martin was conferred the title of Faculty Emeritus by the Board of Trustees. Florida Rep. José Oliva, from the 110th district, greeted the graduates with stories about his familial background and his father’s successes. He advised them to “Know what you believe and stay the course,” and compared it to his family’s struggles and ultimate immigration to the United States from Cuba. As their “way of saying thank you to Flagler College,” graduates Yasmeen Anis and Daniel Lee announced the record-breaking class gift of over 209 individual gifts totaling $6,500. On Saturday afternoon, a second commencement ceremony for the Public Administration program graduated 18 seniors in the Flagler College Lewis Auditorium. This program encompasses the needs of public sector professionals with courses in public policy, budgeting and management, as well as human resources and grand writing. Flagler College is a private, nationally-ranked college located in St. Augustine. The college offers 32 majors, 38 minors, two pre-professional programs and a master’s degree in Education of the Deaf/Hard of Hearing. Flagler College has an enrollment of about 2,500 students, as well as a satellite campus in Tallahassee, Fla. U.S. News & World Report and The Princeton Review regularly feature Flagler as a college that offers quality education at a relatively low cost. A Flagler education is less than half the cost of similar private colleges, and competitive with many state universities. A relatively young institution (founded in 1968), Flagler College is also noted for its historic beauty. The centerpiece of the campus is the former Hotel Ponce de Leon, a National Historic Landmark opened in 1888 by railroad pioneer and Standard Oil co-founder Henry M. Flagler. For more on Flagler College, visit http://www.flagler.edu.